A 21-year-old has died after reportedly being struck by a mechanical object while walking through a haunted house attraction in Hong Kong. The man, identified only by his surname Cheung, was found unconscious five minutes after entering the Buried Alive ride at Ocean Park. He was later confirmed dead in hospital, police said. Park officials say he had wandered into a restricted area, with local media reporting he was struck by a coffin. 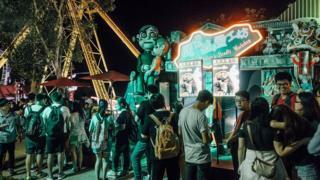 The ride is part of the amusement park's annual Halloween Fest, with this particular ride promising visitors the "experience being buried alive alone, before fighting their way out of their dark and eerie grave", according to the website. According to local media, visitors are supposed to get inside a coffin-turned-slide. Mr Cheung was among a group getting an early look at the rides on offer at this year's Halloween-themed festival, which begins on 5 October. Police said an investigation was ongoing, while the ride has closed until further notice.